We are proud of our local wines and the food we prepare, so please come and enjoy it with us. 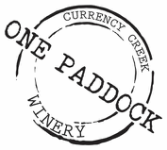 Our cellar door will provide you with a taste of the different vineyards, wines and varietals on offer in the Currency Creek region. We will help you discover a local wine to suit your palate.